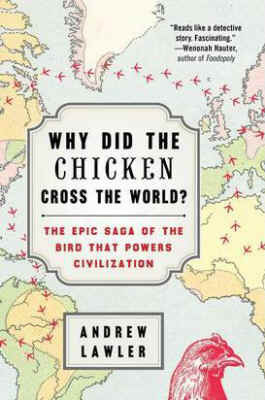 According to the book jacket, Why Did the Chicken Cross the World? presents “the sweeping history that this humble fowl deserves.” Lawler entertains the reader with vivid accounts of how chickens have been exploited through the ages for medicine, sacrifice, sport, science, food and war, right up to where, through his eyes, you can watch a contemporary cockfighting spectacle in Manila, witness a Kaporos chicken-swinging ritual in Brooklyn, peek inside a chicken research laboratory at Michigan State University, and catch a glimpse of an industrial “broiler” chicken shed where these very world conquerors – our “partners” in the project of powering the human race with their proteins – sit in dead silence until the chicken catchers, pumped up for violence, come cursing, kicking, clacking and hollering at them, a squad of terrorists descending on birds who are sick and lame and never harmed anyone. Lawler’s summary of cockfighting fits nearly every scene he shows: “The contest is about the human rather than the animal. . . . [T]he bird is simply an extension of its owner.” Research for his book brought him to United Poultry Concerns on the Eastern Shore of Virginia – part of the Delmarva Peninsula including Maryland and Delaware where more than half a billion chickens are confined in thousands of toxic sheds throughout the region, and millions are slaughtered each week – to interview me and see our sanctuary chickens in October 2013. Yes, so I said, but pessimism about an atrocity and its outcome is not the same as feeling, or being, “ineffectual” in one’s commitment to alleviating the atrocity, nor is it an assessment or equivalent of one’s (or one’s organization’s) ability or accomplishment confronting the atrocity. The fact that a situation may be beyond one’s control does not make one’s actions toward it, per se, “ineffectual.” Lawler’s book, and maybe his conscience, benefitted from my book Prisoned Chickens, Poisoned Eggs: An Inside Look at the Modern Poultry Industry, and from other writings of mine that he read. He told me during his visit that until he encountered the idea in Prisoned Chickens, Poisoned Eggs that by eating chickens we are eating their misery, it never occurred to him. And probably most readers never thought of it either, but perhaps now they will. I believe his book benefitted also from our personal interview and as a result of his seeing our sanctuary chickens living and being treated in ways that differ starkly from how chickens look, act, and are treated in the various situations our species forces them into – situations that, as Lawler describes cockfighting, are about “the human,” not chickens. The chickens, poor souls, are simply extensions of their owners, whether it’s cockfighting, religious sacrifice, genetic manipulation, or whatever. Those of us who want chickens to live sanely as chickens, instead of as what Lawler calls a sanctuary’s “fowl flotsam” and “misfit poultry” – we are not the anthropomorphic ones. The abusers are. Anthropomorphism originally referred to the attribution of human characteristics to a deity. It now refers almost entirely to the attribution of consciousness, emotions, and other mental states, once commonly regarded as exclusively or predominantly human, to nonhuman animals. Anthropomorphism based on empathy and careful observation is a valid approach to understanding other species. After all, we can only see the world “through their eyes” by looking through our own. The imposition of humanized traits and behaviors on other animals for purely selfish purposes, forcing them to behave in ways that are pathologic to the animals themselves, is not the same thing as drawing inferences about the emotions, interests, and desires of animals rooted in our common evolutionary heritage. This slap at chickens is an example of false anthropomorphism. Chickens do not pick and pull at each other, or get into “cockfights,” in their tropical forest homes. They are foragers with a strong family life whose picking at one another in captive squalor and sterility is a form of distorted behavior engendered by living conditions that frustrate their nature and reflect the psychopathy of their captors. Thirty years of keeping chickens, and I know. Sure they have spats now and then – so what? They’re sentient, social beings, not robots. When Andrew Lawler visited our place, I took him upstairs to look down at the chickens in the yard, surrounded by trees and moving about in the loveliest rhythms and patterns of their daily activities.